Zeus Juice e-liquids at SmokeyJoes.biz - find your next All Day Vape! Back in early 2013, Paul Curtis started mixing his own flavours and passed them out to friends to try, the word quickly got out about the flavours he'd created - primarily being "Black Astaire". Due to how fast and unexpected the popularity grew, Paul decided to take a loan out through the government scheme NEA for small business and he purchased large amounts of ingredients and equipment. 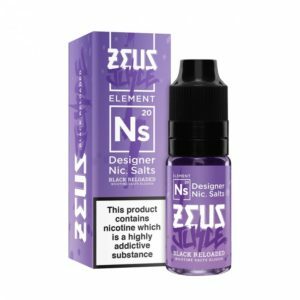 For the next 2 years, Zeus Juice massively outgrew Paul's original expectations and was very quickly becoming one of the most popular E-Liquid lines in the UK. Personal Statement From Paul Curtis (MD) "I've been producing juice for just over 3 years now - I started up Zeus Juice because I've got a VERY sweet tooth and just couldn't find flavours that hit the spot without spending a fortune - so that's my aim, I want a line of juices that can be vaped everyday and don't break the bank!" Back in early 2013, Paul Curtis started mixing his own flavours and passed them out to friends to try, the word quickly got out about the flavours he’d created – primarily being “Black Astaire”. Due to how fast and unexpected the popularity grew, Paul decided to take a loan out through the government scheme NEA for small business and he purchased large amounts of ingredients and equipment. For the next 2 years, Zeus Juice massively outgrew Paul’s original expectations and was very quickly becoming one of the most popular E-Liquid lines in the UK.